So, this is actually a dried cherry, blueberry, banana, pecan and maple syrup oatmeal, but who wants to write all that into a title? Not me. But I bet you would want to eat it! There is really no special recipe for this. It is pretty straight forward but I will list my additions to it in case you don't make your oatmeal real often. I cannot believe that I used to buy prepackaged flavored oatmeal. 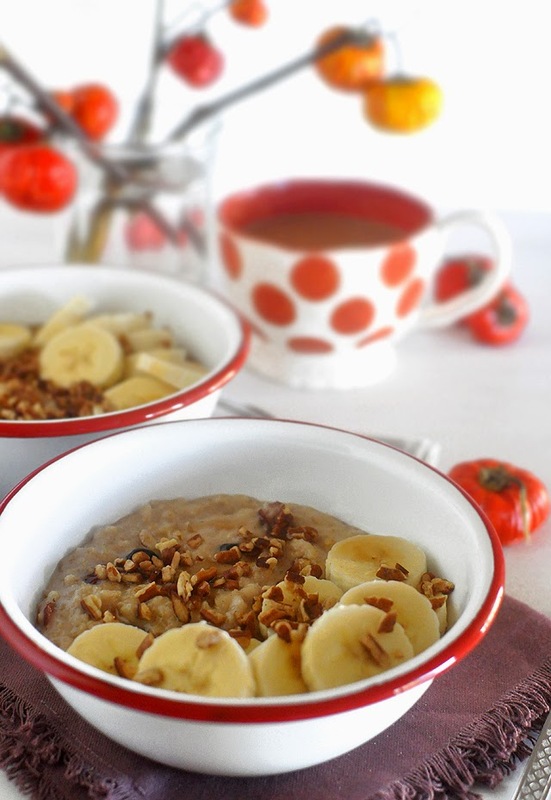 It is such a pale comparison to the real thing and oatmeal is one of my favorite breakfasts now. A few months ago my favorite combo was creamy peach oatmeal or macadamia nut and mango oatmeal with ginger. I drool just thinking of it again. 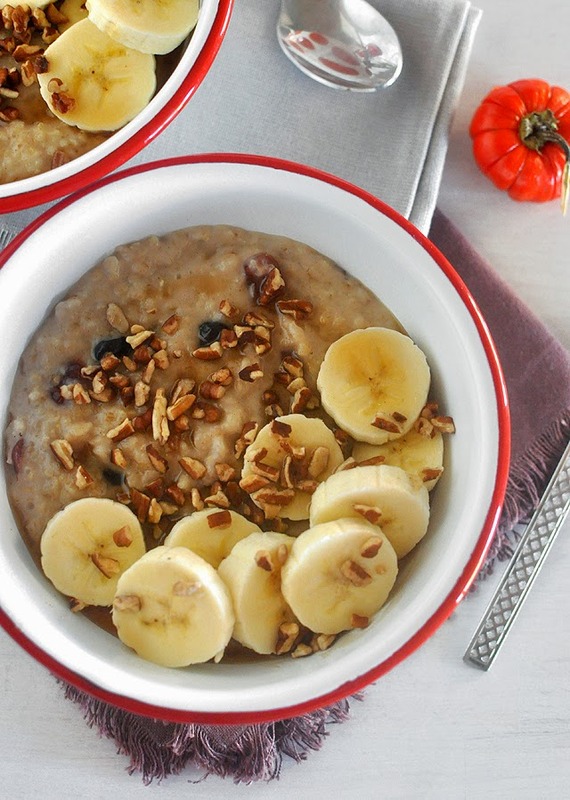 But Fall must be the best time for oatmeal. Just think of all the amazing apple, pear and pumpkin combinations. My next to do is carrot cake oatmeal, yum. Another one to look forward to in a few months is eggnog oatmeal. Now that one is already really a dessert. Until then here is this simple version with some fresh and some dried fruits and my favorite, pecans. Put the oats and water in a small pot and bring to a boil, lower the heat and add the cherries, blueberries, half and half, pinch of salt, sugar and half of the pecans and simmer for 3 or 4 minutes. 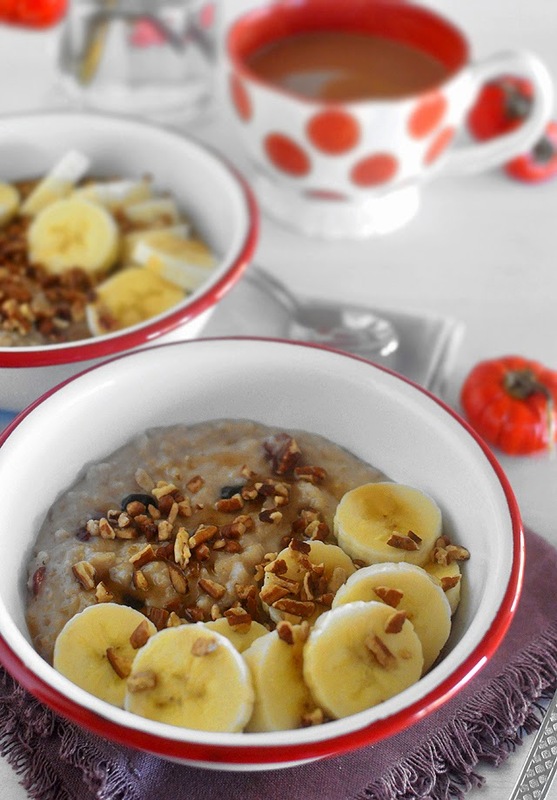 Serve in the bowls with sliced banana and pecans sprinkled on top. Ta-daaaa. That's it. Tiny bit bigger effort than instant oatmeal but so much healthier and tastier (and cheaper, too!). This is a good way to start the day.